Today was one of those days…too much to do and too little time, although I won’t lie I often feel like that many days…just usually dinner doesn’t come so early but with daylight savings and all- it creeps up! So keeping this in mind, as well as dinner guests coming over- I was able to come to an easy but delish solution. I placed a whole chicken in a crock pot, it came out soooo nice and tender! yum! Best of all- it was SO easy!! 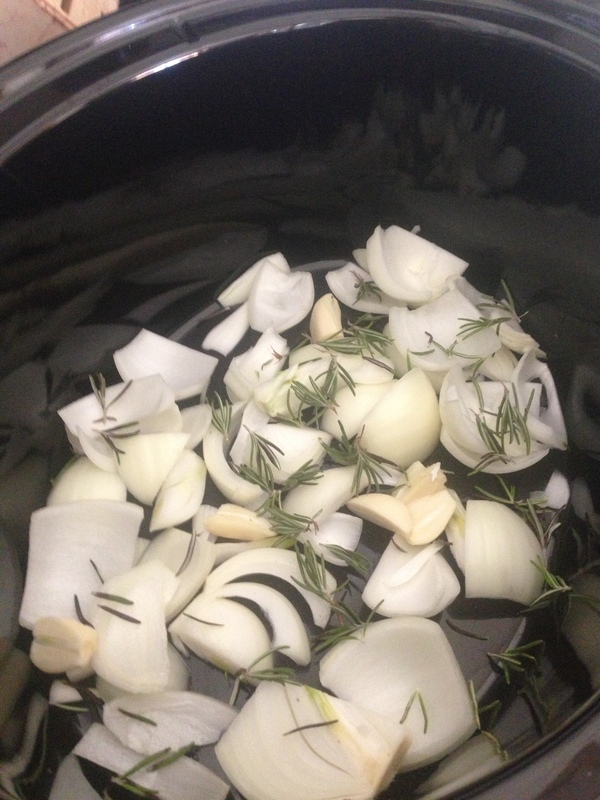 First chop onions and place in crock pot with your other raw veggies (potatoes, carrots, celery, etc) . Next rub down chicken with olive oil and then sprinkle with salt, pepper, and rosemary. Then place a few lemon slices on and around chicken. Place the chicken on top of raw veggies in cooker, then place lid on and cook on high for 4 to 6 hours or on low for 6 to 8 hours. After chicken is fully cooked, the skin wont be crispy yet so to take care of this I placed in broiler at 525 degrees for about 5 minutes.